Music City Kitchen is a fully licensed commercial kitchen permitted by the Tennessee Health Department and Department of Agriculture. Designed specifically for aspiring food entrepreneurs from Mobile Food Truck Vendors, Caterers, Bakers, Professional Chef’s, and Home Cooks. 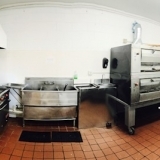 MCK has the amenities to help make your food business grow and succeed. You can prep, store, and park all in one central location. Convenient location minutes away from Nashville’s highways and main thoroughfares, our location makes perfect for your business to operate efficiently and practically.